Private transfer from your last hotel to the airport. One Driver allowance per rental car is included in the quotation given. Other services included in this price: Travel Consultancy, Customized Itinerary, Pre-programed GPS, Personalized Roadbook, Exclusive Guidebook, Helpline While Travelling, Welcome at the Airport, Private Transfers to/from Hotel on Arrival and Departure, 2 Monuments Entrance tickets, Walking Tour, Train Tickets, Flamenco Show, Winery Tour with tasting and Cooking Class. 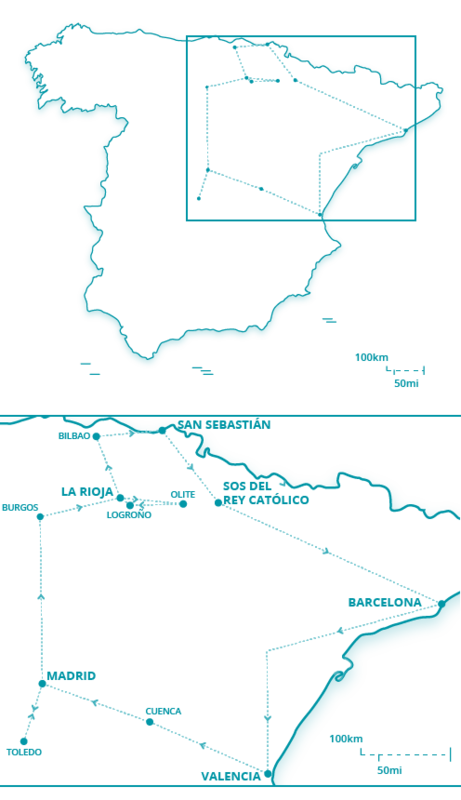 Spain Trails can get you a better deal based on ourpartner’s discounts. If you are 55 or older, please let us know, and we will apply any available discounts to your tour price. Bienvenido a España! Today, our representative will be at the airport in Madrid to meet you and give you your Travel Kit with all the documents you will need for your trip. You will be taken to your hotel straightaway, where you can settle in and relax a little. If you prefer, however, you could use the time to get to know the area around the hotel and take a first look at the Spanish capital. You could, for example, walk down to the Puerta del Sol and admire the large square and the façades of the surrounding buildings. Make sure you look at the famous clock and statue of El Oso y El Madroño, an important symbol of the city. Carry on walking down and you will have a very “sweet” beginning to your walk at the Chocolatería de San Ginés, where you can try their famous churros con chocolate caliente (sticks of sugar-covered dough that you dip into hot chocolate), which have become a Madrid specialty. 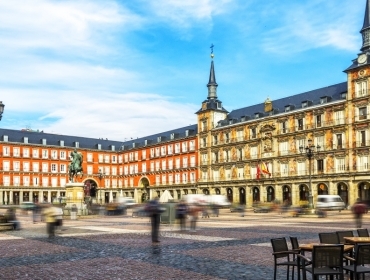 If you feel like walking a little further, visit the rectangular Plaza Mayor, which, as the name indicates, is the largest square in the city. 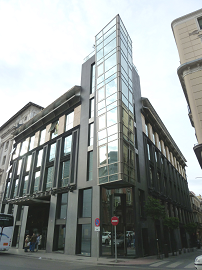 H10 Tribeca offers stylish accommodation in the heart of Madrid's business district. It is close to the Santiago Bernabéu stadium. The rooms in the hotel are modern and sound-proofed. The natural-coloured interiors are chic and inviting. All rooms have a flat-screen TV and air conditioning, and all face onto the city. Free WiFi is available throughout the hotel. The hotel's stylish restaurant, Tribeca, is open all day. Here you will find a range of tasty dishes. 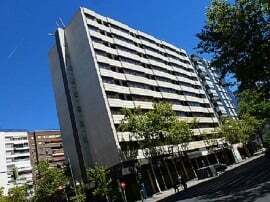 H10 Puerta de Alcalá is within 100 m from Madrid's Retiro Park and a 15-min walk from the iconic door that lends its name to the hotel. Its stylish rooms feature wooden flooring, minibar and pillow menu and are equipped with air conditioning, free WiFi and TV. Amenities are included in the modern bathrooms. 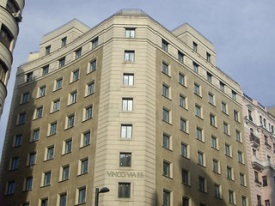 H10 Villa de la Reina has an ideal location on Madrid’s central Gran Vía. 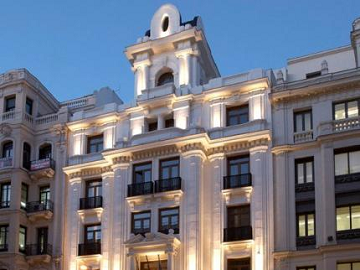 The hotel is set 200 m from the famous Puerta del Sol, while the Prado and Reina Sofia Museums are a short walk away. Rooms at H10 Villa de la Reina are elegant and comfortable. They all come with a Madrid Style guidebook, Nespresso coffee machine, mineral water, bathrobe, slippers, and free WiFi. 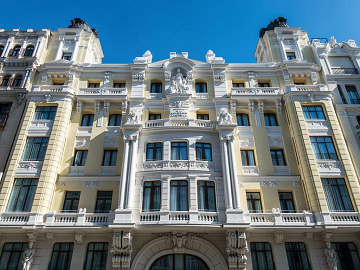 Set on the heart of Madrid, on the famous Gran Via, it features a stunning terrace with views of the city's most emblematic buildings. The modern and fresh-looking rooms at The Mint combine green and white walls and feature parquet floors. They include air conditioning, a flat-screen TV, work desk, minibar, and a coffee machine. The bathroom comes with a bath or shower, hairdryer, and free toiletries. Some rooms also include a seating area. Situated on Madrid’s Gran Via, just 150 m from Plaza España, Vincci Via 66 features a wellness centre and rooftop terrace with city views. 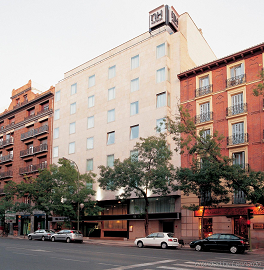 Hotel Vincci Vía - 66 offers air-conditioned rooms with an elegant and stylish design, inspired by the theatre world. All rooms have free internet access, a flat-screen TV and pillow menu. Toiletries are included in the modern bathrooms. This boutique hotel houses a permanent display of art from Papua New Guinea. Featuring beautiful designs, a gym and a steam bath, it also offers a glass lobby bar, a small rooftop swimming pool open in summer, a terrace and a cocktail bar. The décor of the hotel and the rooms includes special lighting, natural wood and stone and Oriental art. All rooms are soundproofed and offer free wired internet, free wi-fi, a flat-screen TV and a DVD player. Hotel Villa Real is located in the Triangle of Art. The Thyssen-Bornemisza Museum is just 150 m away. 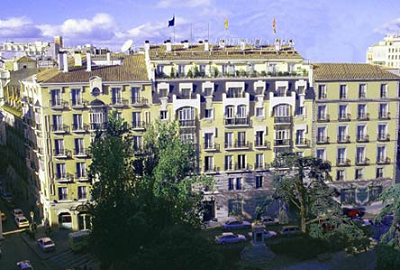 This luxury hotel is considered a classic among Madrid’s luxury hotels, decorated with wood and marble, and it has a fine art collection, which includes Roman mosaics and Greek ceramics, some from the 3rd Century BC. The elegant hotel rooms are soundproofed, and have a laptop safe, a LCD TV, a CD player and a minibar. Some rooms have a sofa or a balcony. Wish to further explore the highlights? Totally understandable, it is easy to fall in love around here. We can make the necessary arrangements to extend your vacation either if you wish to stay a little longer in that particular stunning location, arrive earlier to become accustomed to the country or if you wish to relax and see more after your tour. Perfect, but you prefer not to drive? No problem either! We are happy to provide pricing for a driver or even designing a different tour using public transportation (train or bus) and or transfers. Interesting, but not exactly what you are looking for? Spain Trails can adapt this tour to your expectations, interests and needs or even design a new tailor-made one exclusively for you. Contact us!